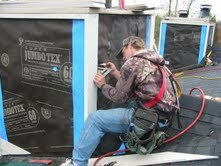 Vinyl, cement board, metal, stucco, and wood siding properly installed and flashed with allowances for proper drainage. Wood or concrete re-construction with waterproof components properly applied to surfaces. Removal and reinstallation of window systems with allowances made for drainage including proper head flashing, pan flashing, membrane flashing, and weather resistive barriers. All aspects of asphalt, and wood roofing replacement to allow for proper building interface and venting. Retrofitting existing foundations for waterproofing and installation of industry-proven drainage systems. Complete replacement of rotten structural components prior to re-roofing or re-cladding is documented with photographs. The owner benefits knowing the structure is being repaired properly prior to exterior building envelope replacement and with required documentation. 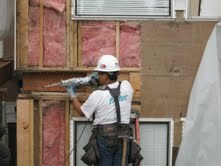 Our method of documenting, estimating and tracking rot repairs, comprehensive Critical Path Method (CPM) scheduling, electronic submittal procedure, as well as our thorough review of all subcontractor invoices and sub-tier payments, all provides for a timely project delivery which is within budget; while protecting our clients from claims against their properties.